This is the seventh in a series of articles examining clues to the winner of the U.S. Presidential elections in Aries Ingress horoscopes; today we look at the 1904 Presidential election. Click on the Presidential Elections tag in this post to see all articles in the series. We are examining all U.S. Presidential elections from 1880 to 2016, each time adding to our list of rules to determine the winner. We cast the Aries Ingress horoscope set for Washington, D.C. in the given Presidential Election year. The Aries Ingress is a horoscope set for the moment the Sun enters Aries, the start of the astrological New Year. It is a long-standing astrological tradition that the moment of the horoscope predicts major events for that location in the upcoming twelve months. March 20, 1904. 7:58:33 PM, EST (-5), Washington, D.C. The incumbent party is portrayed by the tenth house of the “king.” The challenger party is the fourth house and its ruler. This is because the fourth house is the seventh from the tenth; the king’s opponent. In our Aries Ingress horoscope, we examine what is happening to each candidate’s house and house ruler to see who wins. The Aries Ingress shows which party wins the White House, not the specific candidate. I use traditional planetary rulers of signs only (no Uranus, Neptune, Pluto). 1. The Incumbent Party: The tenth house is ruled by Cancer, and its ruler is the Moon in Taurus, applying to square Saturn in Aquarius. The tenth house from the tenth, or the seventh house (the victory or glory of the incumbent) is ruled by and occupied by a very strong Mars in Aries, which is beneficial to the incumbent, though can be overruled by other factors. 2. The Challenger Party: The fourth house is ruled by Saturn in Aquarius, in the fourth house. Its tenth house of glory is the radical Ascendant, which is ruled by exalted Venus in Pisces in the fifth house. Conclusion: The incumbent party (the Republicans) wins the Presidential election. 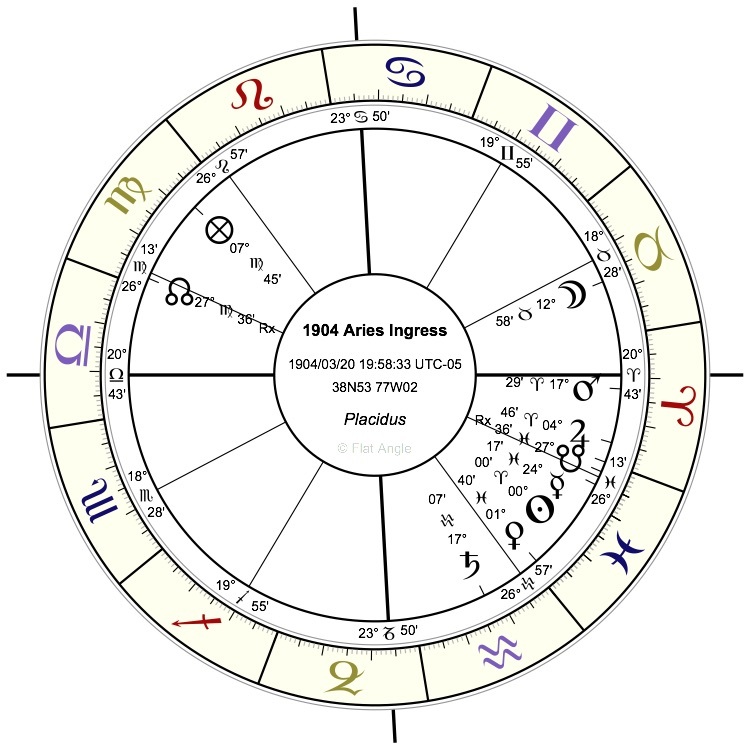 I consider this a busy chart, with the additional twist that the planet symbolizing the incumbent party applies to the planet of the other party. There is traditional support for the idea that in a battle or contest, the planet in its exaltation will prevail over the planet in its domicile. This can be overruled by other testimonies (see the 1896 election), but here we have the Sun and Saturn applying to an aspect, so their respective sign placements are emphasized. Thus, we have one testimony for the incumbent (Theodore Roosevelt, R). As Gary pointed out in the 1892 Election comments, it is helpful to look to the tenth house from that of the incumbent or challenging party, as the turned tenth is the house of victory of the challenging party. The seventh house has the Moon in Taurus just passing out of it, which is inauspicious for the incumbent. However, the ruler of the seventh house, Mars, is in his own sign and entering the seventh house. This seems a strong point for the incumbent party’s victory, so – testimony two for the incumbent. The Ascendant (the tenth from the fourth, and therefore the glory of the challenging party) is ruled by Venus in Pisces, its exaltation. This is generally auspicious, but Venus is in the fifth house and not aspecting the ruler of the fourth house, Saturn, so her ability to help the challenging party is limited. We could call this half a testimony for the challengers, due to Venus’s powerful status. The 1904 election featured Theodore Roosevelt, the Republican incumbent and previous VP, who became President upon William McKinley’s assassination in 1901. His Democratic challenger was Alton B. Parker, a judge, who by all accounts ran an ill-organized campaign, with the result that Roosevelt won handily. The incumbent won the election. Source: Wikipedia. Interesting, Nina. And I look forward to reading your other posts on this. Btw, I wrote on this topic, looking at five recent presidents who have AA birthdata, and their inaugeration day solar arc directions. They all had aspects to natal, and involving a natal angular planet. Thank you, Charles! Please feel free to post a link to your article here.